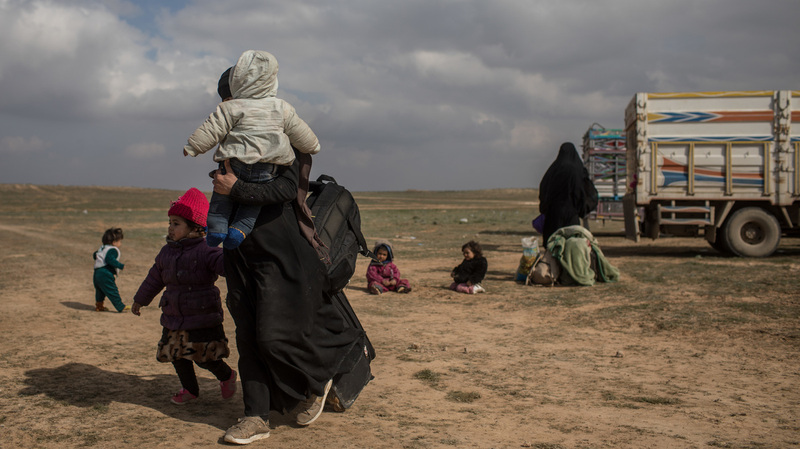 Civilians who have fled fighting in Bagouz wait to board trucks after being screened by members of the Syrian Democratic Forces (SDF) at a makeshift screening point in the desert on Saturday in Bagouz, Syria. After weeks of fighting the SDF announced the start of a final operation to oust ISIS from the last village held by the extremist group. U.S.-backed and Kurdish-led Syrian forces said Sunday they are locked in a fierce battle to take over the final territory controlled by ISIS in eastern Syria. The Syrian Democratic Forces (SDF), supported by U.S. air attacks, have successfully overtaken the terror group, which gained control of large swaths of northeastern Syria in 2014, NPR’s Lama Al-Arian reports for our Newscast unit. The assault began on Saturday after almost 20,000 people were evacuated from the ISIS-held area in the eastern province of Deir el-Zour along the Iraqi border, according to SDF spokesman Mustafa Bali. Nearly 600 ISIS fighters remain inside the two villages that comprise the enclave, and many of them are believed to be foreigners, he said. Al-Arian reports that despite efforts to help civilians flee the area, hundreds are reportedly still stuck inside. The Syrian Observatory for Human Rights, a group that monitors human rights abuses in Syria, said SDF forces are moving “cautiously” because of ISIS-planted mines. While Bali is describing the offensive as the “final battle” against ISIS, the extremist group still holds some territory in the area south of Damascus largely controlled by the Syrian government, according to Reuters. ISIS previously controlled a huge section of Syria and Iraq, declaring a caliphate in 2014 and making billions of dollars from oil revenue, extortion and kidnapping. Since 2011, Syria has been embroiled in a violent civil war, which created a safe haven for extremists and allowed ISIS to spread quickly. But the fall of two major cities – Syria’s Raqqa and Iraq’s Mosul – in 2017 marked the beginning of the group’s loss of ground. U.S. intelligence officials told Reuters that Abu Bakr al-Baghdadi, the self-declared leader of ISIS, is reportedly alive and suspected to be hiding in Iraq. The weekend offensive by SDF forces comes after President Trump said on Wednesday he expected to announce as early as next week that the U.S.-led coalition had recovered all of the area previously held by ISIS. Trump is moving ahead with his plan to withdraw 2,000 U.S. troops from Syria, despite warnings from U.S. military and security experts that militants in Iraq and Syria could prepare an insurgency if U.S.-led forces back off. “The coalition’s hard-won battlefield gains can only be secured by maintaining a vigilant offensive against the now-largely dispersed and disaggregated ISIS that retains leaders, fighters, facilitators, resources and the profane ideology that fuels their efforts,” Votel added. The withdrawal of U.S. forces could also spell trouble for their closest ally in the region, the Kurdish People’s Protection Units (YPG), who Turkey considers a terrorist group. The Syrian government has said that the areas controlled by the Kurds would eventually revert to government control. A U.S. official told Reuters that the U.S. military is planning to completely withdraw from Syria by the end of April.